Do you have a favourite comfort food for cool weather? 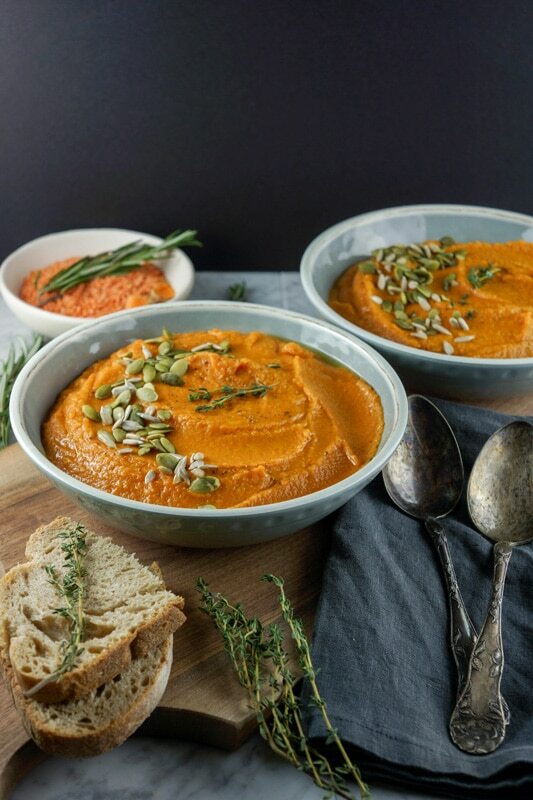 A nutritious and comforting Carrot and Red Lentil Soup, ready in under 30 minutes! Heat up a large pot over medium heat. While it's heating up, start chopping the veggies. When the pan is hot, add a generous amount of olive oil and immediately add the vegetables (except garlic) in it to roast them a bit and develop flavour. Stir every minute or so. You can continue chopping while this is going, just add the veggies as you go until you're done (should only take a minute). Add the garlic and red lentils, stir. Add all the spices (except salt and pepper), and let it cook for a minute, stirring. Then add the water, cover, bring to a boil, and reduce temperature to medium-low heat and cook for 20 minutes. Add the coconut milk. Stir until all melted, cook for 1-2 minutes. Remove from heat, add the salt and pepper, and purée with a handheld mixer (be careful, it's hot!). 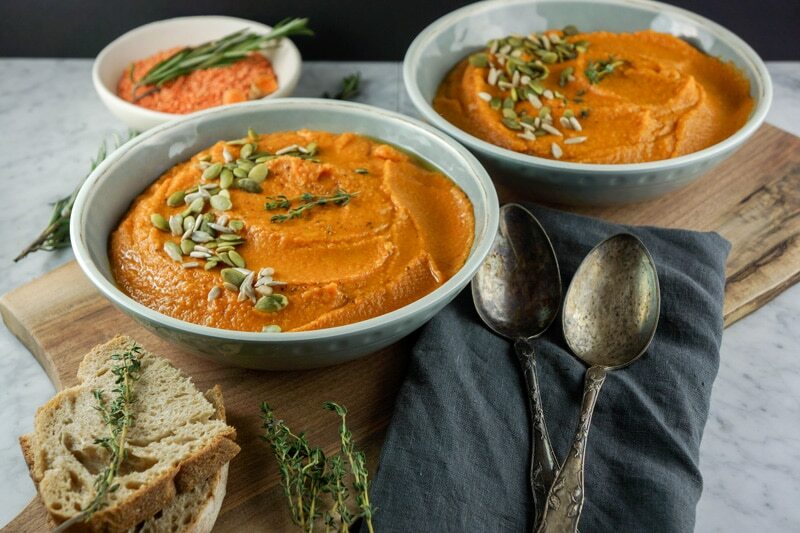 Serve at once, accompanied by some roasted pumpkin and sunflower seeds, a nice slice of homemade country bread and a large green salad, and you've got yourself a healthy meal! I made this for dinner tonight, adding some golden beet and a bit of celery. It was so beautiful that I chose not to purée it. Excellent flavour — the spicing was perfect! Thanks for another great meal, ECP!! This sounds spectacular! I have only had carrot soup twice and I really enjoyed it. The flavours you use here are all ones I love! Saving to try. I know we are going to devour it. Thanks! It’s a great flavour in soups for sure. It didn’t last long in my house! I made some garlic toasts to go with it, and it was incredible, yet so simple. Gabby, I’m totally with you on loving Indian comfort food during the winter months. My next recipe also has an Indian flavour profile! 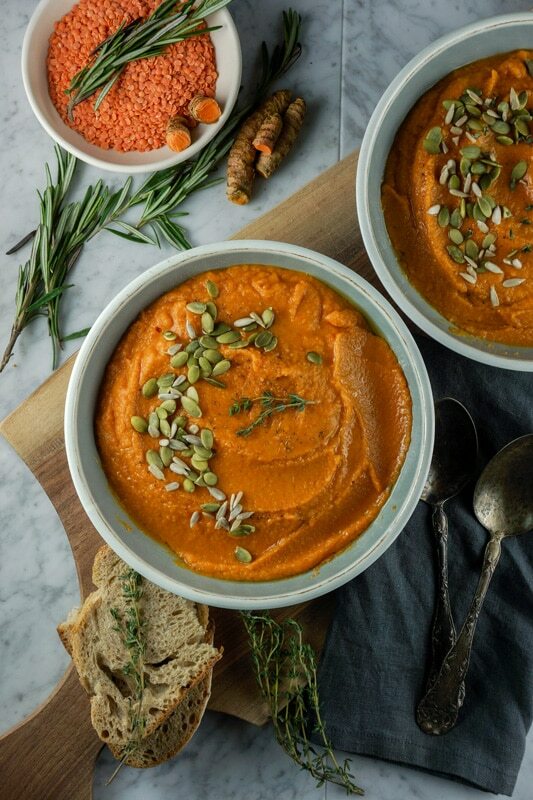 I love how thick, hearty and nourishing this soup looks while being vegan and gluten free — right up my alley. 🙂 Thanks for sharing and cheers to an incredible 2017! We frequently make pureed veggie soups around the house, and even though lentils often make it into the mix, I’m always forgetting to use red lentils. They’re so easy, and the way the fall apart makes them absolutely ideal for a soup like this. Plus you can’t go wrong with lentils and Indian spices! 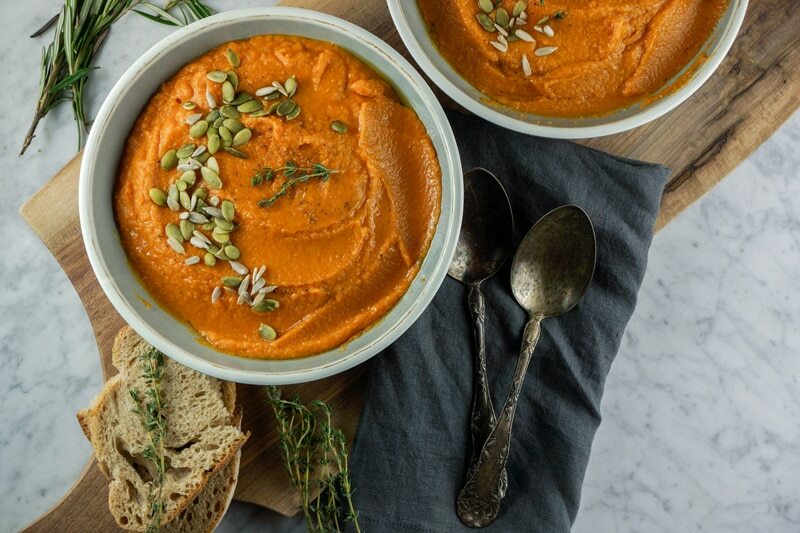 Good, wholesome, healthy, cold-weather fare – I love it!